Yeah, global warming or not (well, some scientist claims it's non existent), here in Ottawa, mid december, yet we still have 6 degrees of temperature! For Canada winter, that's spring!! !, wait, summer!!! WEll, not that I'm complaining, hehehe. I too,however, want to indulge in hot ramen at night ^O^. That looks really good! Please be careful about the noro virus, wash your hands and gargle! My first time here obachan, you have a wonderful blog. 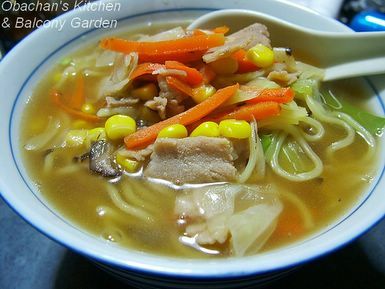 The ramen soup looks delicious. Wow. Sounds like it IS getting warmer here and there. Hope you enjoy warm winter and ramen. Thanks. I’m more nervous at my workplace (kaiseki place) than in my kitchen. This was one of the GOO-TA series by Nisshin… the frozen version. Not bad but I’d rather buy something different next time.